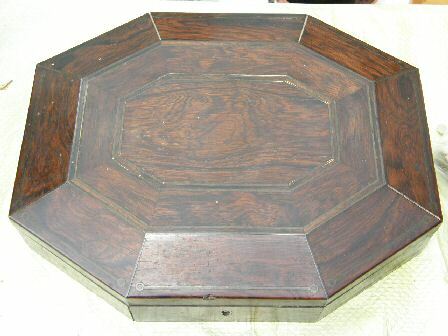 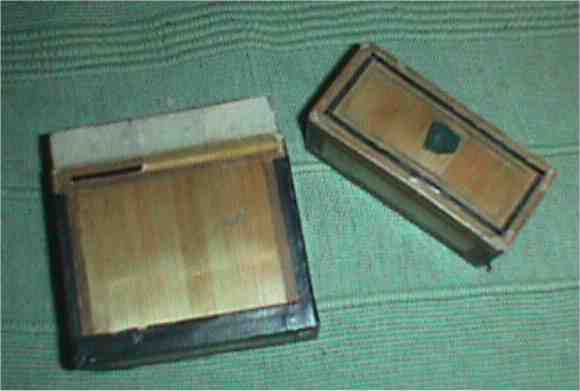 This is an asymmetric (ie two sets of four sides are the same length not all eight) – octagon shaped card box measuring approx 11inches by 9 inches. 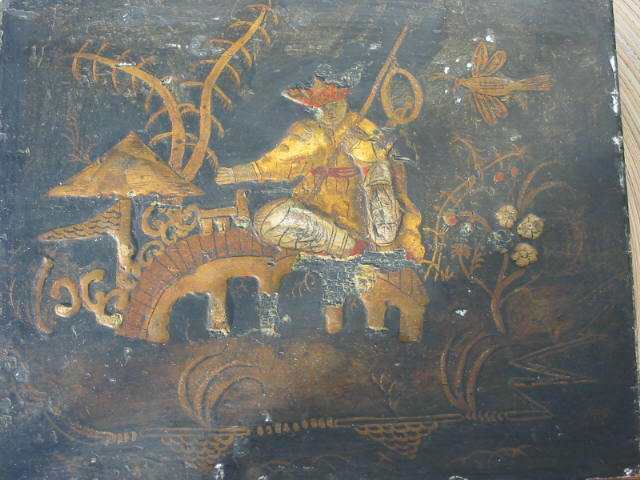 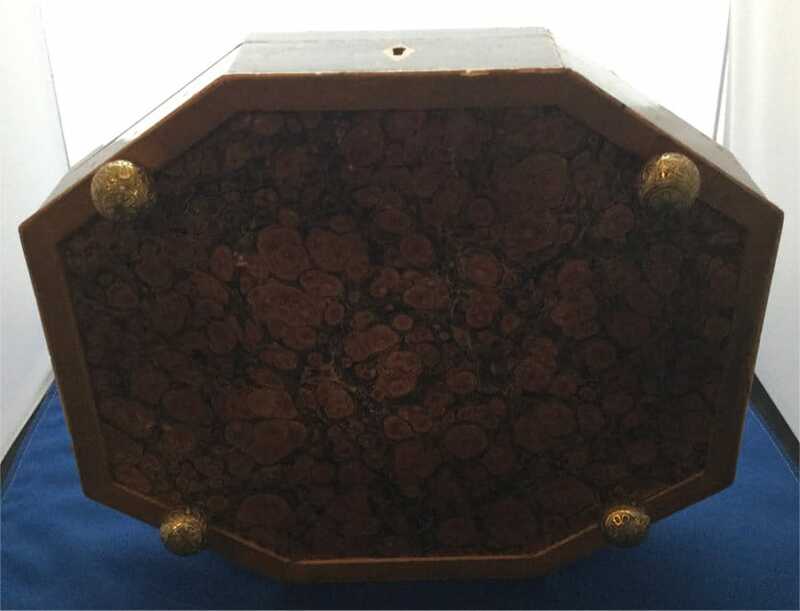 It is made of rosewood with brass inlaid. 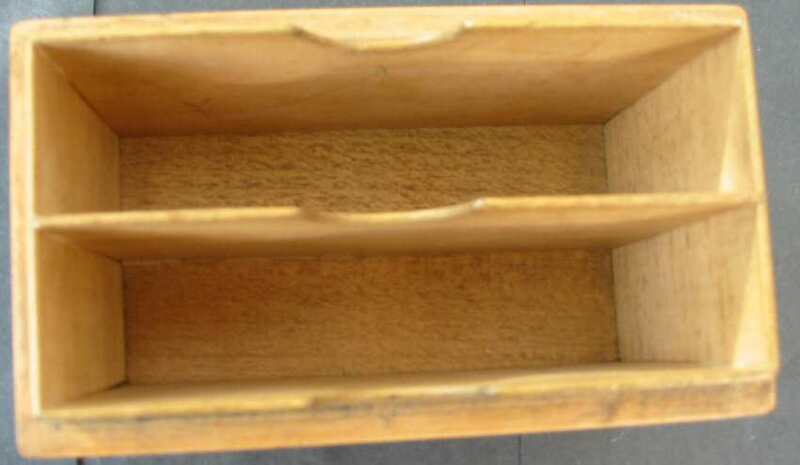 No Key. 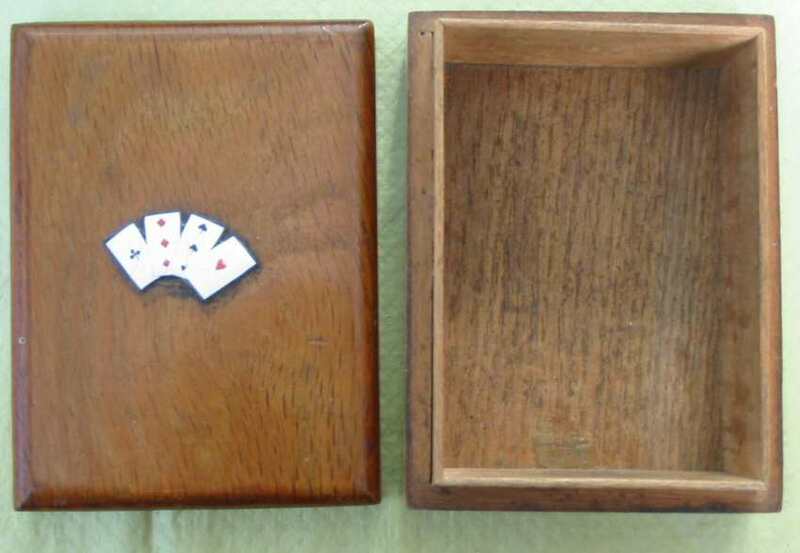 It has 4 compartments for playing cards and 5 for gaming counters. 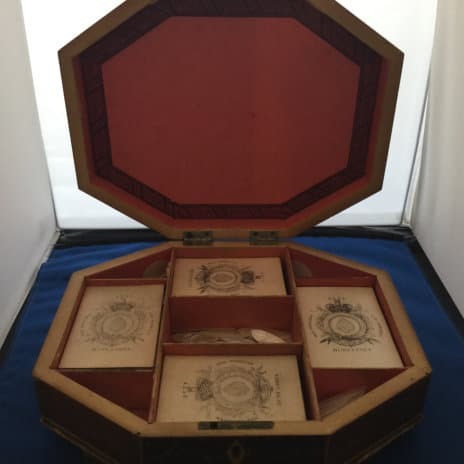 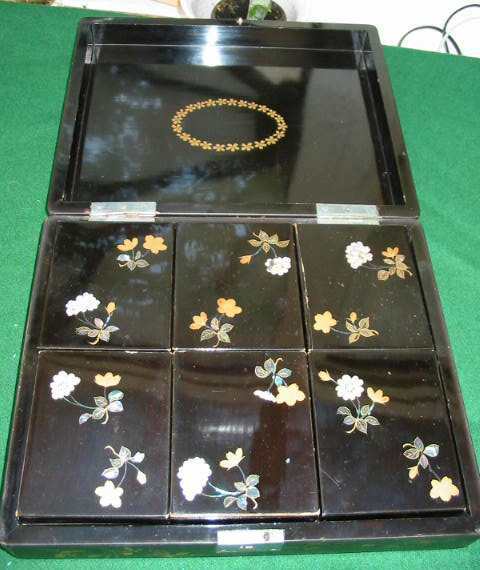 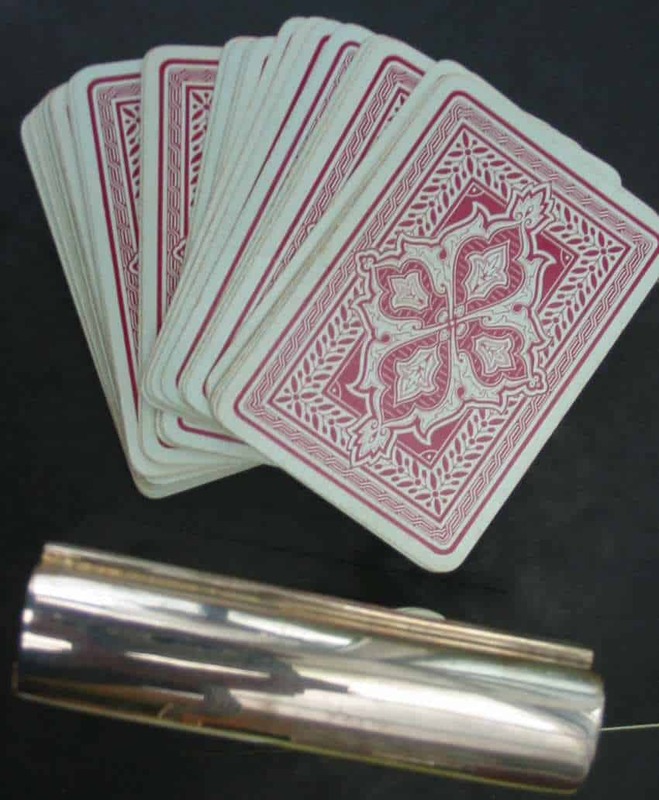 There are also 4 items used for lifting out the playing cards – these are card sized covered to match the box with ribbon attached on which the cards were placed – the ribbons could then be used to lift the cards plus base – one has both ribbons the others one ribbon. 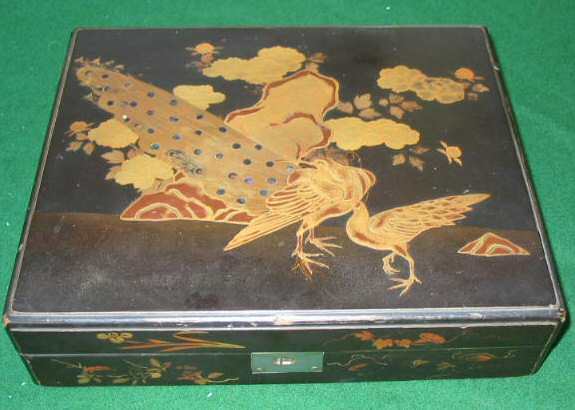 The inside of the box is in very good condition – original covering, clean and bright. 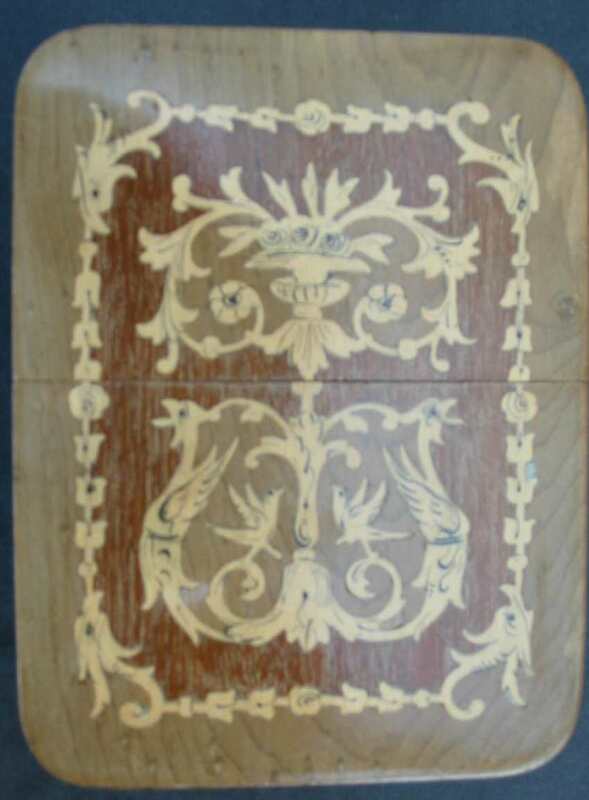 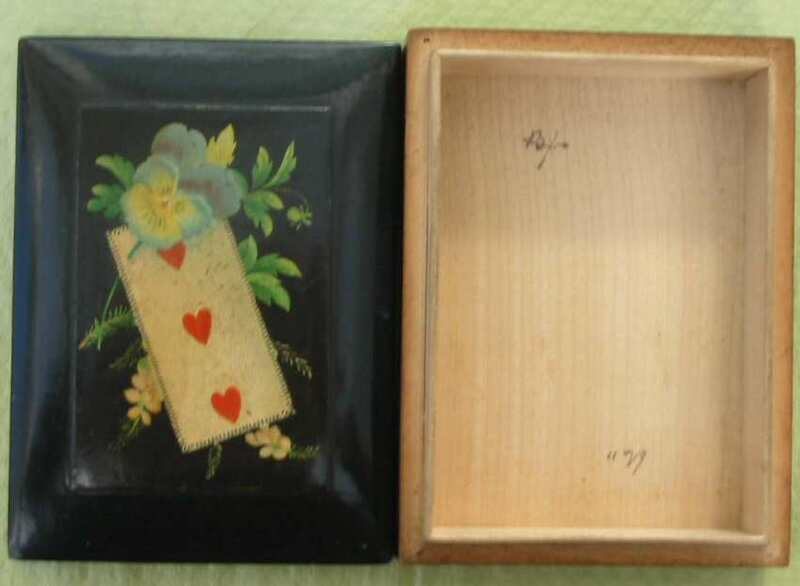 The exterior is very good – missing a couple of short brass inlays from the top and three from the sides – here is a very small knock on the front edge – otherwise it is lovely – cards are for illustration and NOT included in the price – however we can provide period card if required at additional cost. 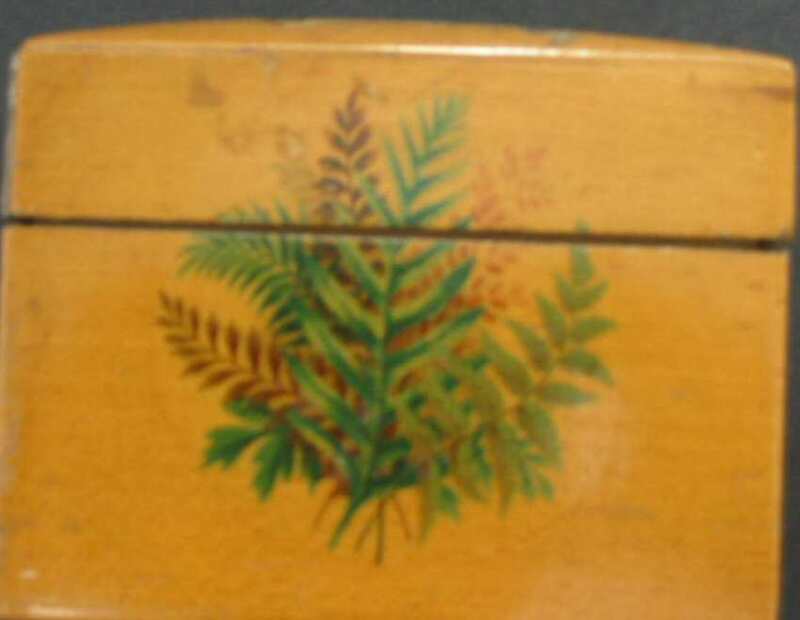 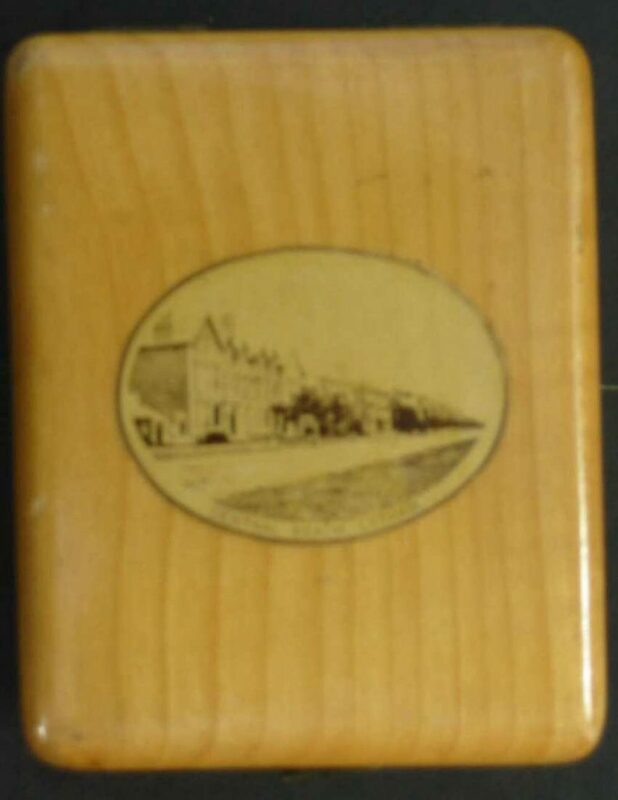 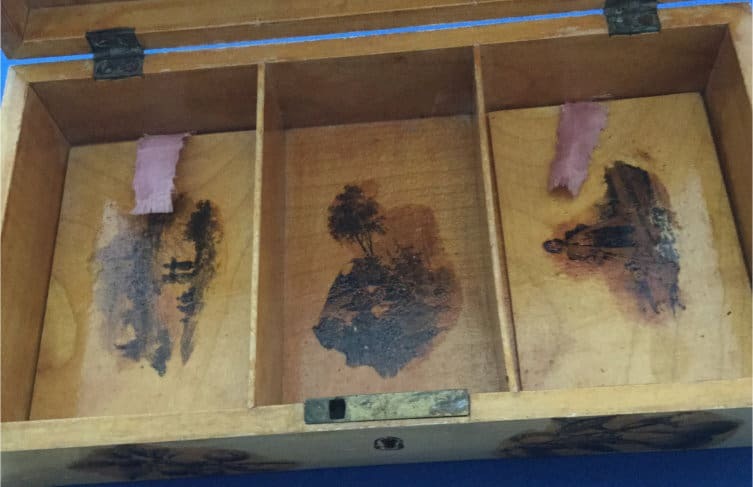 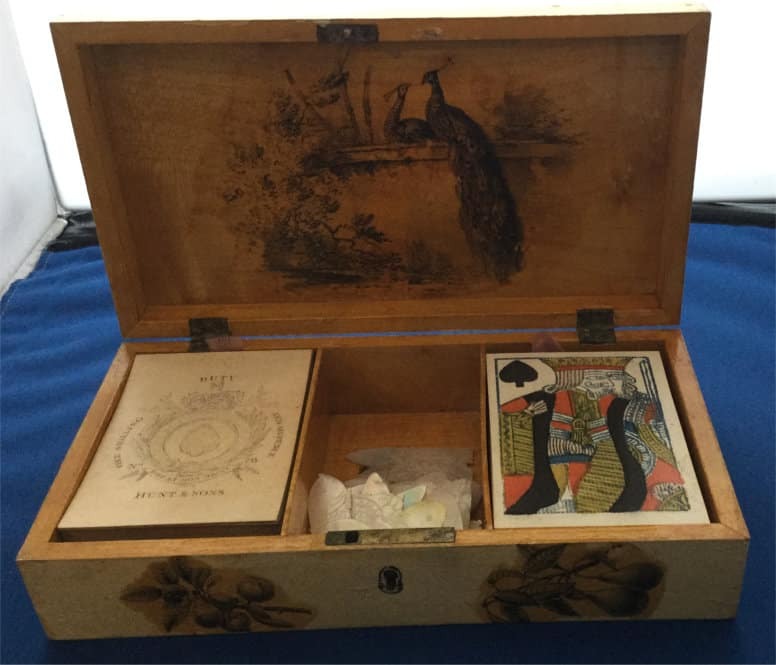 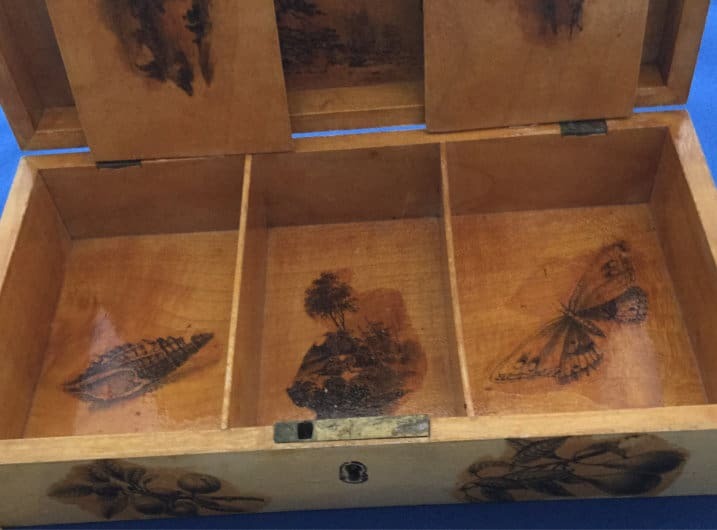 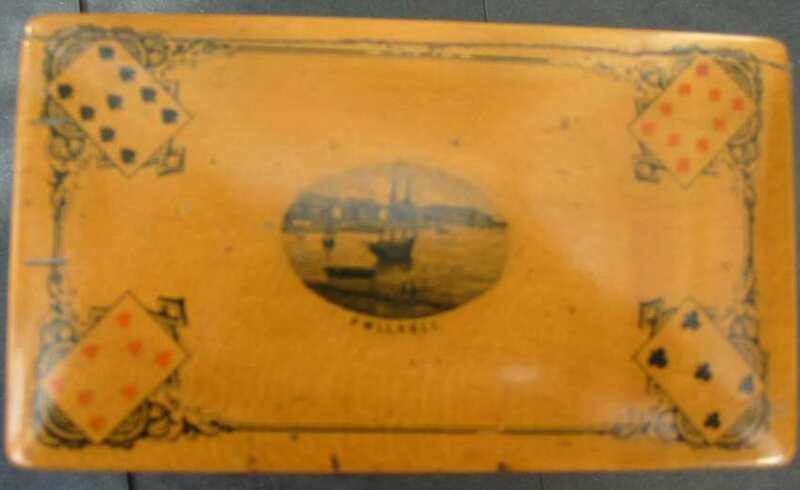 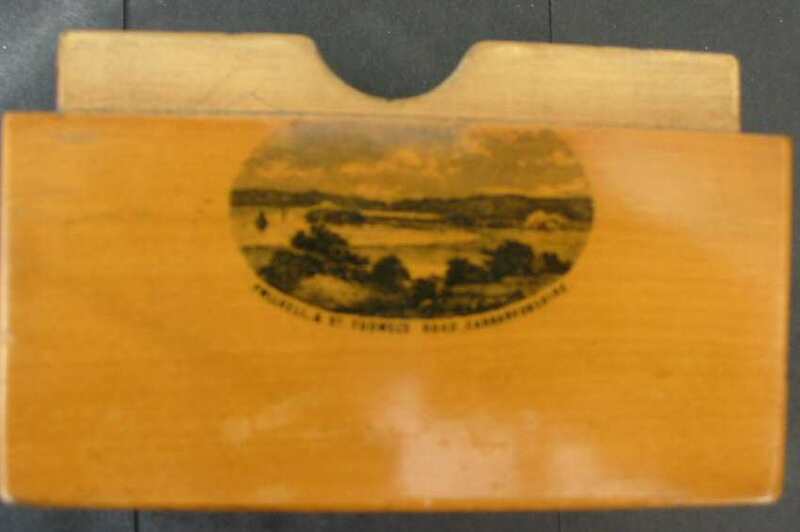 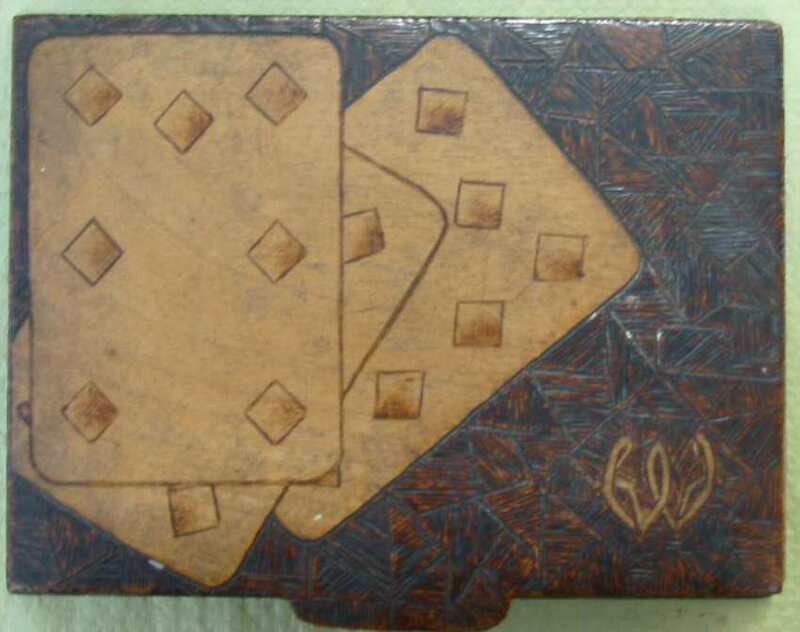 Lovely box in a beautiful colored wood – Seaweed pattern on the two sides, top playing cards and view of Pwllhell – front view of Pwllhell & St Tudwel’s Road, Carmarvonshire – Condition is very good – Some small marks on front lid – transfers undamaged. 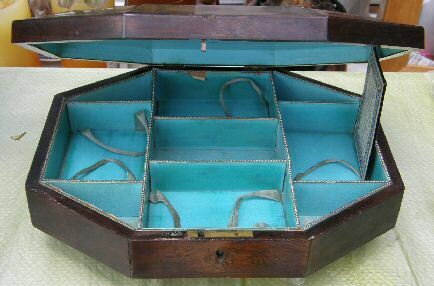 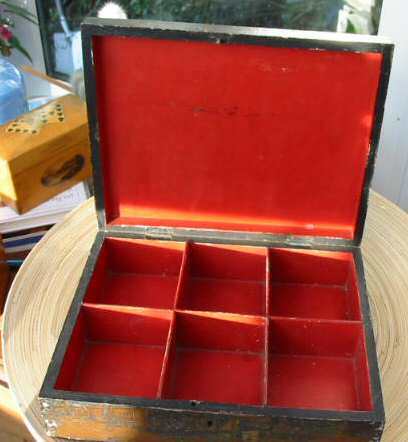 This card box is made of straw work – And we believe it is early, c1860s, – from the cards that were in it – but they could have been added later – It is made of card covered with straw work – It is a two part telescopic style box – With a piece of ribbon to lift the lid off – There is some damage ie missing pieces of the straw work – Which can be seen – There is also, we believe, some restoration at the base, – The brown area is, we believe, not original – But it matches well with the side but differs in style with the top – Any further pictures or details please ask. 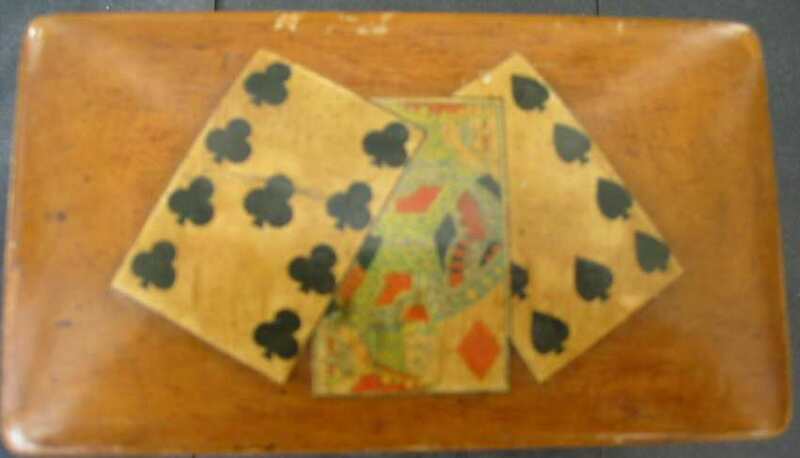 An early 19th Century playing card box. 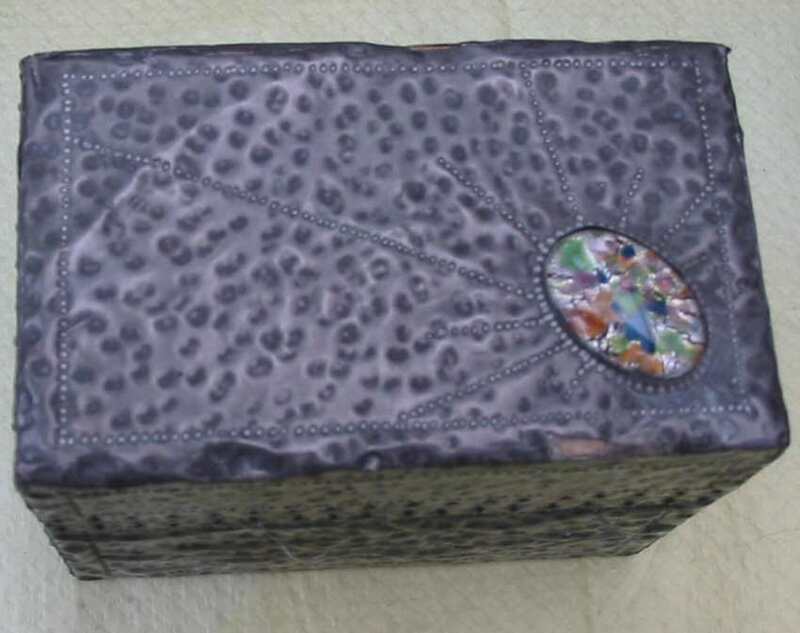 Box is decorated with monochrome transfer prints inside and out. 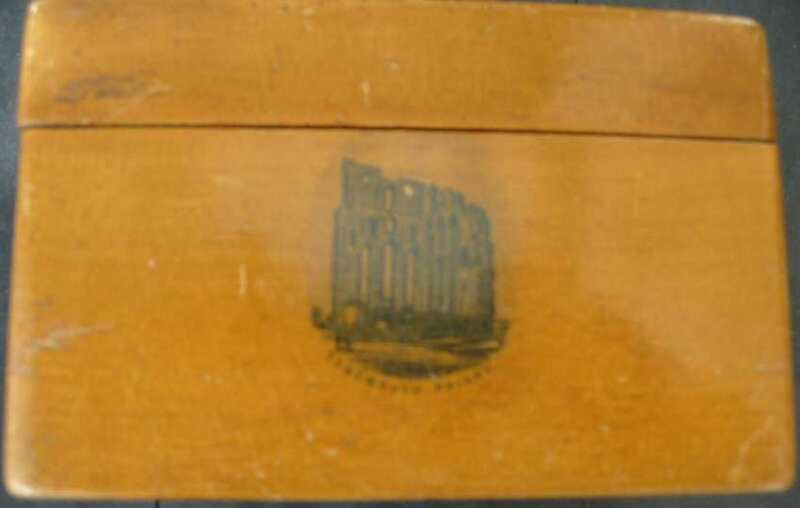 The box has very minor, and non-distracting, fading here and there on the outside. There are no dents or damage. 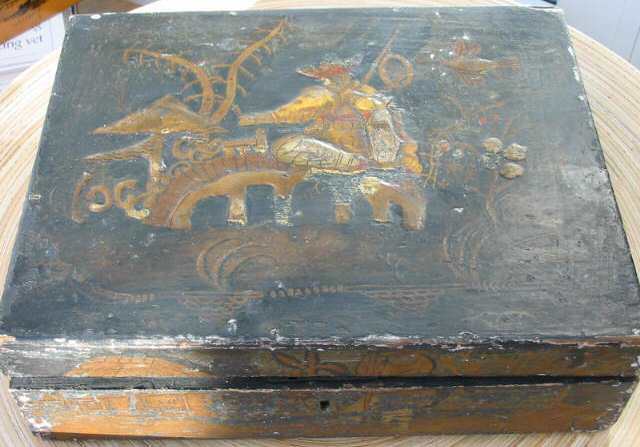 The inner decorations and lifting panels are as new. 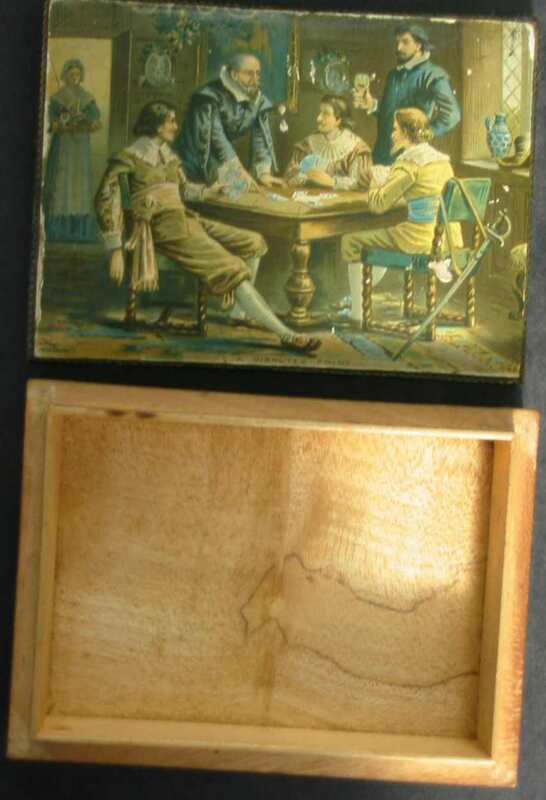 The cards shown, as well as the mother of pearl counters, are not included and are shown to put box in historical context. 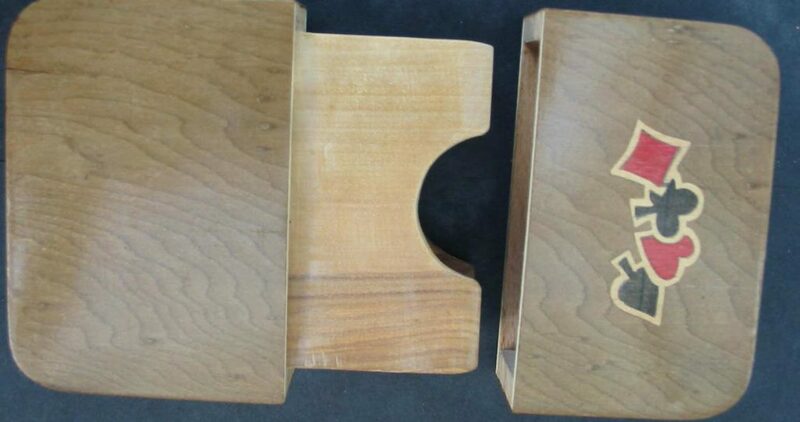 We can quote for two appropriate and contemporary packs and MOP Counters to be included. 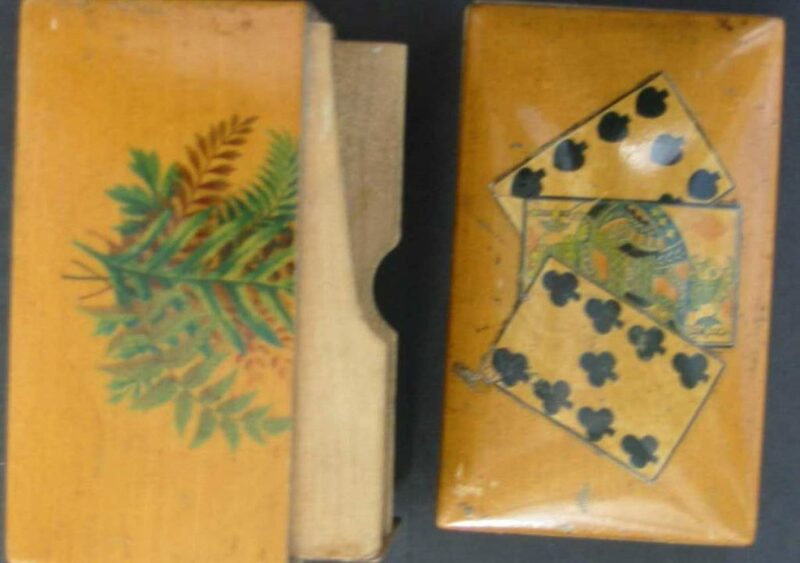 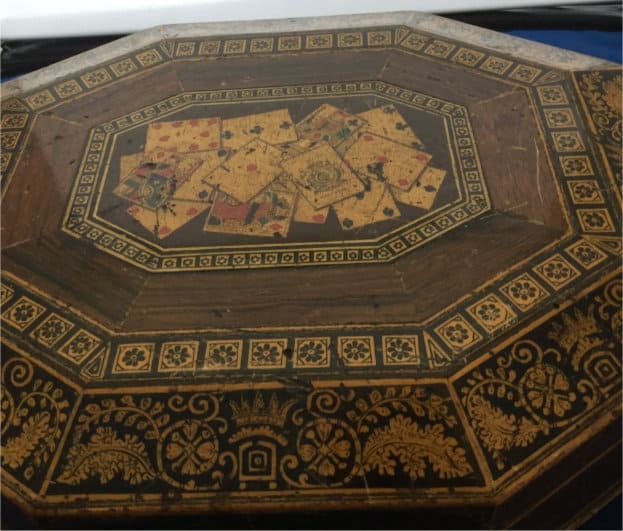 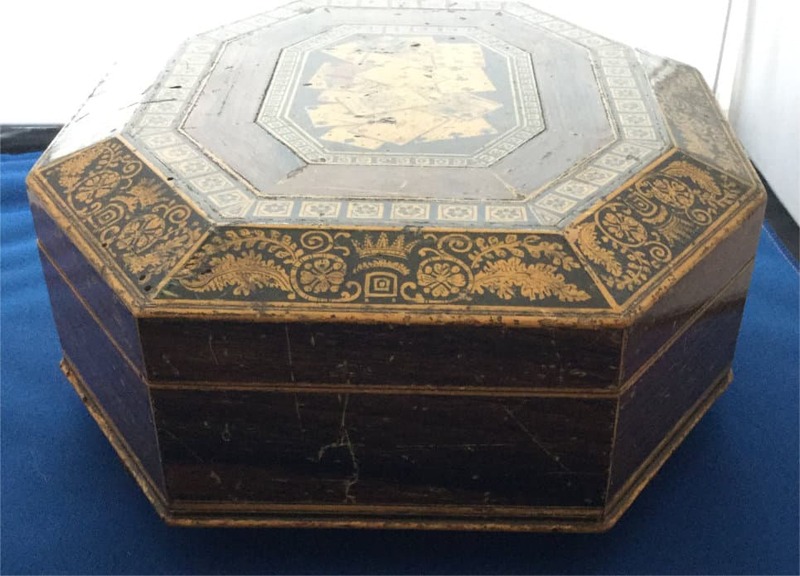 This is a George III Pen work Octagonal Playing Card Box. 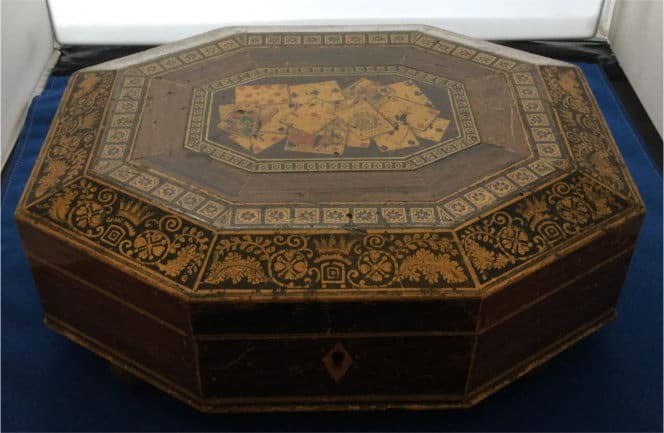 There is some wear and tear and minor scuffs and bumps but overall the box is presentable. 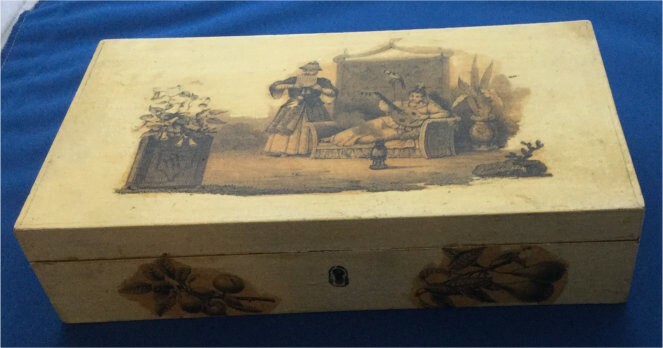 There is no key present. 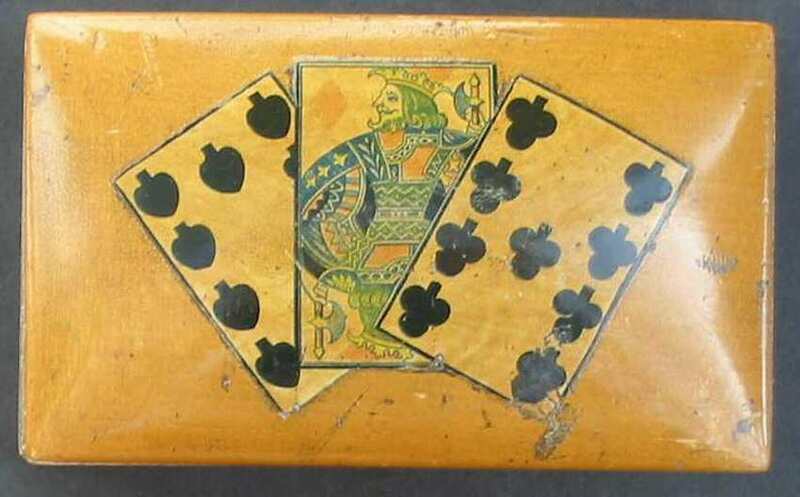 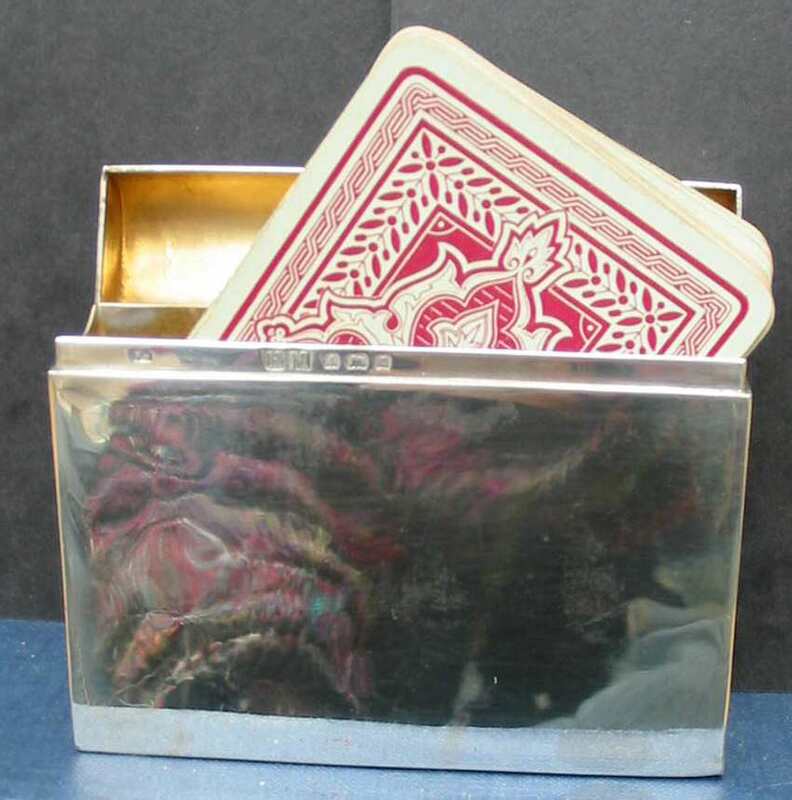 The lid has a central cartouche of Playing Cards with a Duty Ace of Spades and a leaf outer border. 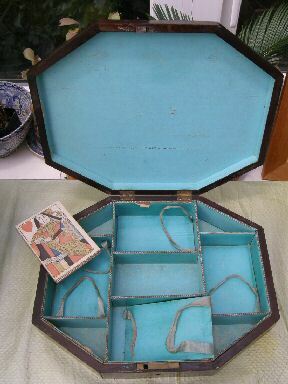 Inside the box is lined with the usual pink Georgian lining and there are four major compartments for playing cards. 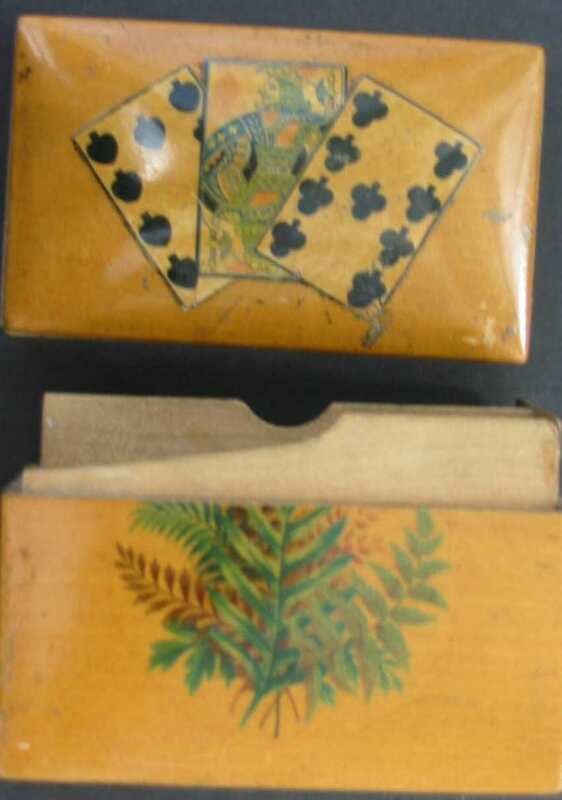 The cards shown, as well as the mother of pearl counters, are not included and are shown to put box in historical context. 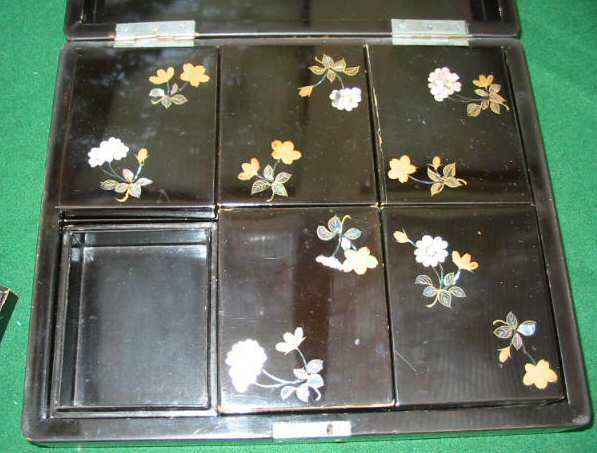 – We can quote for two appropriate and contemporary packs and MOP Counters to be included.